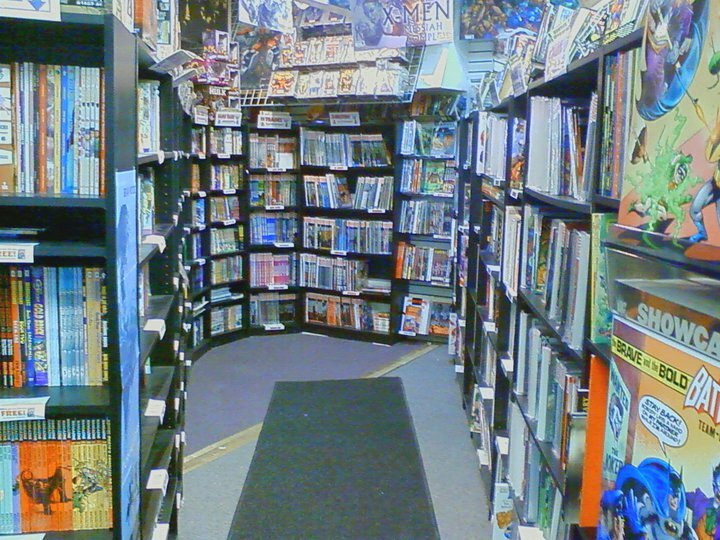 If you have ever stumbled into a comic book store and found yourself overwhelmed, you are not alone. Actually, I’ve been back in the comics’ game for a while now, and I still feel a bit overwhelmed when I step into a comic book store. Maybe it’s the overwhelming amount of titles spreading over the walls like paper tendrils menacingly trying to ensnare you, or maybe it’s an intimidating owner/worker that does not seem to care about you or your comic ignorance. For me, it’s a mixture of both. However, with a little training and perseverance, you (just like I) can have positive comic book store experiences. I frequent a place in my hood called Alternate Reality (AR as my homies call it). AR is owned and operated by a guy named Tim Davis. To the comics’ newcomer, Tim can be a bit intimidating; after all, the guy really knows his stuff, and seeing that he does not have much of a staff, he is often fairly busy when you stop in, but once you get to know him, as I have started to, you realize that Tim has one goal: to get new comics in people’s hands and out to the public. I’ve been going to the store for over two-years now; I even introduced Tim to the guy that’s been running Magic The Gathering events at the store for quite some time (Yeah, I’m a nerd, so what?! ), and while I do not know everyone when I am in there, I feel like I am a part of the culture and community that is AR, and I’m happy to support a great local business. I went to interview Tim today with the hopes of lifting the curtain that has been covering the mystery of comic shops for teachers for way too long. I wanted to get a professional’s take on the industry, and I wanted to pitch an idea that I’d hope he’d go for. I would like to start by discussing the cool things that Tim does to get people into his store and out with comics. 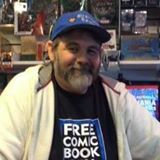 I list and discuss these things simply because I feel that other comic shops can learn a thing or two from Tim’s experience and dedication to his readers. Also, many of you might have no idea that there are opportunities like this out there; I know, if you live on the South Side of Chicago, this pertains much more to you; however, take what you learn here and try to get your local stores to do more. Trust me; if a bunch of teachers try to give these stores money, they will have no problems giving you deals. As far as AR goes, here’s what you can expect: every Thursday, female customers get 20% off; every Wednesday (that’s new comic book day for you newbies) Tim features seven new titles that are 40% off to encourage people to try some new reads; 15% off of new comics. This is not counting other specials and deals that are popping up weekly. Tim even makes sure that he puts cover-less back issues in your bag for free, so you can read and possibly get into a new series. If you have no idea where to find a store like this, you can go to www.comicshoplocator.com for help. As far as advice for new comic-seeking teachers, as I stated before, it’s important to have a buddy or two that is familiar with what is going on in the comic/graphic novel world to work as your insider, a person that you can be as ignorant around as you need to be. But, comic shop workers are great informants as well, as long as they are not like Comic Book Guy from The Simpsons. As I asked Tim about the multitude of different publishers, he gave me the run-down of what each was widely known for. Did you know that ONI Comics, according to Tim, is known for being a “high concept” publisher and might appeal more to the more literary readers among us? And Image Comics is filled with amazing concept titles. We are no longer living in the age of the hero comic alone; comics have exploded into something that could be foreign to many of us. I will not run down every publisher, but please check them out. I guarantee that there is a title out there for each of you. I got my wife into some titles that she now reads on the regular. She was not a comics’ person…at all, but I knew what she would like, and after she tried them, she was hooked. Like all forms of entertainment, you just need find the angle to sink your teeth into. Oh, and encourage your local shops to carry indie comics, AR is big on indie comics, and because Tim is so adamant about allowing his customers to explore a huge variety of titles, I’m always exposed to new stuff…not all amazing, but at least I have options. I mentioned earlier that I wanted to pitch Tim an idea that I’d hope he’d go for, and he did. I asked him if I could design a display dedicated to the comic-store teacher. I want to feature amazing artistic renditions of classic titles to use as supplements or substitutes; forget those old-school Classics Illustrated…they are tired, and no one wants to read them anymore. I want to feature the most commonly taught books in the area and pair them with thematically linked graphic novels to make the learning process more enjoyable for the 21st Century student. I want to create teachers that are fans of comics and graphic novels. I want to encourage all of you educators, once you get acquainted with your store operators, to do the same. Let me know, and I will help you. As I help Tim develop his teacher area at AR, I will also be working to develop teacher areas at other local shops because one store does not a revolution make! Forgive my dramatics…I’m passionate about this stuff; you should support my passions. Anyway, I’m afraid I’ve went on too long here. 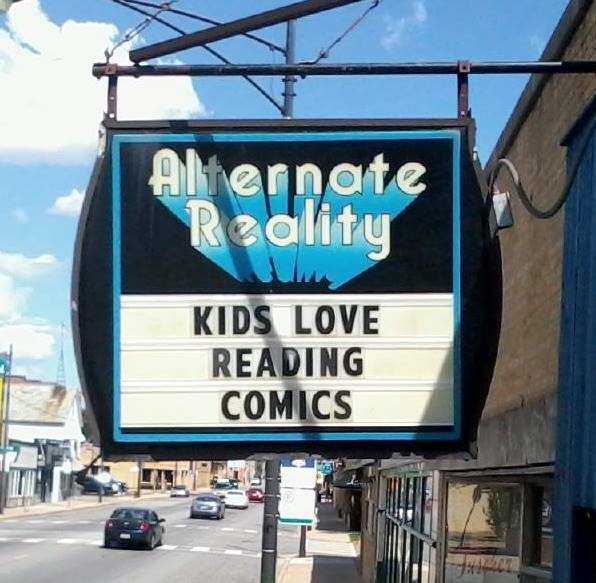 If you are ever on Chicago’s South Side, check out a White Sox game, get a hot dog at Portillo’s, a pizza Lou Malnati’s, and then hit up Alternate Reality at 3149 W. 111th St., Chicago, 60655. Tell Tim Eric sent you.